Believe it or not, I was vegetarian for about 2 years. Actually, throughout my whole life, I’ve been vegetarian at least three times. I have already warned my husband that I will likely go back to vegetarian in the next few weeks. It’s nice to take a break from eating meat and just eat vegetables. In fact, being vegetarian seriously made me a better cook. 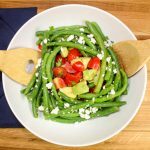 I was forced to be creative with recipes and try new things… so, thank YOU vegetables for pushing me to a whole new level of cooking! A while back, I was thinking about chili rellenos and thought about how I’ve never had anything other than cheese stuffed in a poblano pepper. This got me thinking, what if I make vegetarian enchiladas and use poblano peppers instead of tortillas?! Well y’all, I pursed that thought and was incredibly satisfied with the result. 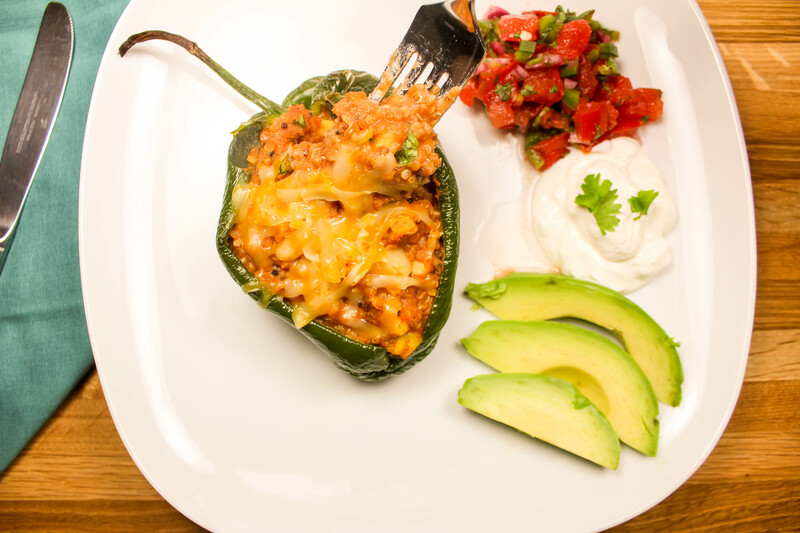 Vegetarian Enchilada Stuffed Peppers are a unique blend of the classic Mexican dishes: chili rellenos and enchiladas. They are packed with flavor, low fat, and vegetarian (but you won’t miss the meat). This is a Weight Watcher friendly recipe and 5 SmartPoints per pepper. 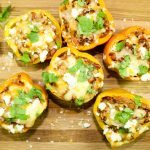 It’s no secret that I like “things stuffed”; there’s so many different stuffed pepper recipes out there. Meaty AND vegetarian! What makes this recipe different is the fact that I used poblano peppers rather than bell peppers. 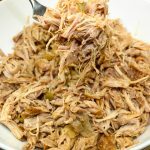 I was looking to add just a little bit of heat to this recipe and poblano peppers have just the right heat level I was in search for when creating this recipe. 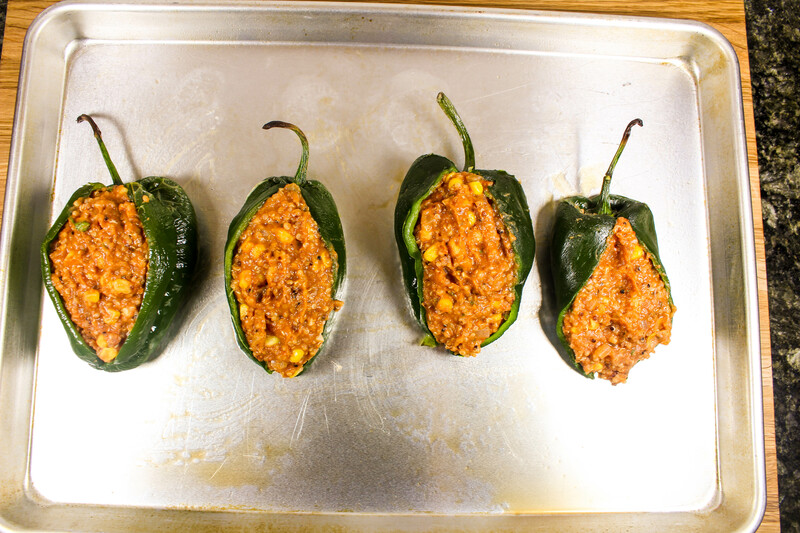 To roast the poblano peppers, preheat oven to 500 degrees and roast the peppers on a baking sheet (my favorite baking sheets are Nordic Ware Aluminum Baking Sheets) for 6 minutes. Once the peppers are cool enough to handle, cut peppers through the center and gently remove the seeds. The stuffing is a blend of cooked quinoa, refried beans, and corn mixed with homemade enchilada sauce. Enchilada sauce is seriously easy to make! My version of enchilada sauce is a blend of tomato sauce, sautéed onions and garlic, and a tablespoon (or two if you want to add even more flavor) of the liquid of canned chipotles in adobo sauce. I usually make a big batch of enchilada sauce and freeze it so that I have it on hand at all times! If you cannot find the chipotles at your grocery store, you can buy them on Amazon! Vegetarian Enchilada Stuffed Peppers are seriously delicious and I guarantee you will not miss the meat; the filling is full of flavor, creamy, and will fill you up. I like to serve this dish with fresh pico de gallo, fat free Greek yogurt, and sliced avocado. My mouth is watering just thinking about this meal! I hope you enjoy these *stuffed* bites of flavor! After quinoa is cooked, add lime juice and cilantro. Fluff with a fork and set aside. Spray baking sheet with non-fat cooking spray. Lay poblano peppers on baking sheet and spray top of peppers with cooking spray. Roast peppers in oven for 6 minutes. When peppers are cool enough to handle, make a cut down through center of the peppers and gently remove the seeds. Return peppers to baking sheet and set aside. Cook refried beans in a small pot on low-medium heat for 5 minutes. Chop onions and garlic and set aside. In medium pot, heat olive oil over medium low heat and add chopped onions and garlic. Season with salt and pepper. Add tomato sauce, liquid from chipotle chilies in adobo sauce, and cumin. Bring to a boil and reduce to simmer. Cook for 10 minutes on low. Add corn and cook for 5 minutes. Turn off heat of pot. Add quinoa and refried beans to enchilada sauce. Mix well. Gently stuff each pepper with quinoa bean filling. Bake peppers in oven for 5 minutes. Remove peppers from oven and top with Colby jack cheese. 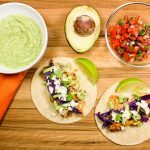 Serve with fresh pico de gallo, reduced fat greek yogurt (or sour cream), and avocado. The stuffing to these peppers is freezer friendly!